An Ancient Solar System...: Moon base ahoy? Yes, this is a post about Moonbases. Whenever someone uses the phrase ' Moonbase' I get very sceptical*: The ISS took a dozen nations ten years and hundreds of billions to build, and it's a historical fact that it happened almost more by good luck than political will. So I tend to assume Moonbase ideas are a good way to get a soundbite and drum up some publicity, and not a lot more. 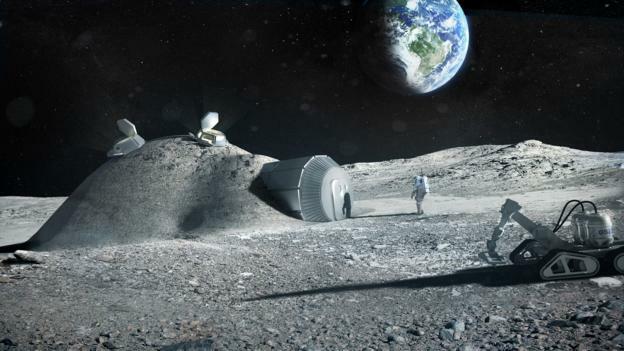 Above: ESA's pans for a 'Moon Village'. Courtesy of ESA. * Almost as skeptical as I get when I hear the phrase 'Boots on Mars'.